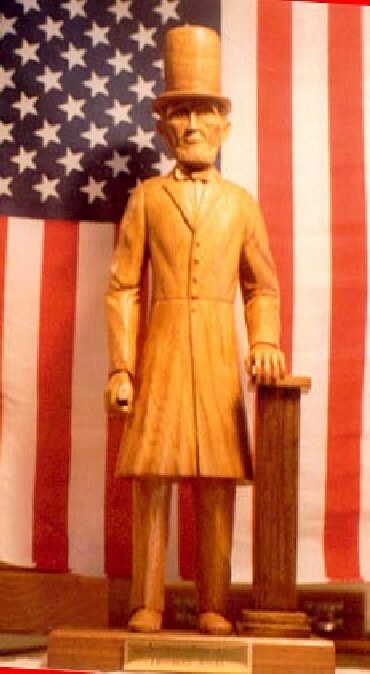 This carving of the President was inspired by the many references to Abraham Lincoln's ability as an orator. The piece depicts Lincoln as he arrives, notes in hand, to deliver a speech, dressed in his frock coat and familiar stovepipe hat. single piece of butternut wood, and stands on a walnut base with a brass plate. The podium is constructed of maple wood. "Lincoln" is part of a private collection in Pennsylvania. When Richmond fell to the Federal forces in 1865 President Abraham Lincoln toured the city. The ex-slaves in the city were wild to see "Marse Lincum" and crowded around him to see if he was real and to find out if they were really free. 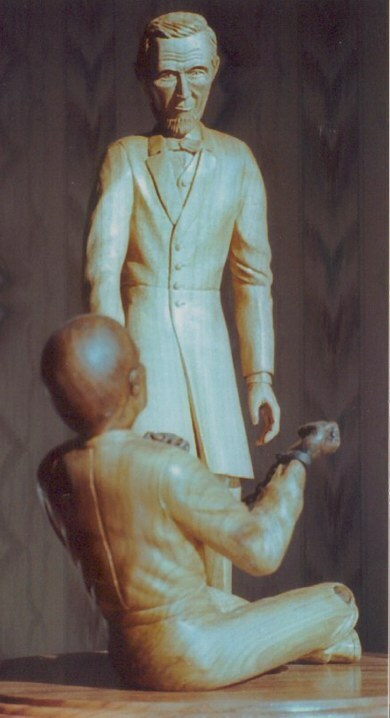 This carving depicts a slave seated on the ground holding his manacled hands out to Mr. Lincoln. Lincoln is reaching out to the man to help him to his feet. The figures are carved in Butternut wood and mounted on a Walnut base with a brass nameplate. "The Great Emancipator" is part of a private collection in Canada.